When I lived in Cyprus, I couldn’t get enough of the large waxy potatoes Cyprus is famous for. They used to arrive in the local greengrocers still covered in the damp red earth in which they were grown – a region in the southeast of the island. As most of them were exported, it was a short season and we had to make the most of them. One of the best ways of eating them was to cook them in the oven in a mixture of olive oil and water. That’s right, water. The combination of roasting and steaming made the potatoes soft and because the Cyprus potatoes are of the waxy variety, they still kept their shape. In Cyprus, they peel the potatoes, cut into quarters then roast them in a moderate oven with olive oil, water, dried oregano and lemon juice. In Greece, they cook them in the same way, replacing the oregano with tomatoes. I tried both ways and have ended up combining both methods and I use much less oil. These roast potatoes are soft, aromatic and tangy with lemon and they look stunning as the tomato juice soaks into the potatoes and turns them a vibrant golden colour. They are also versatile as they can be a meal in themselves or an accompaniment to a roast, something from the grill or fish. If you have any left over the next day (doubtful), fry them with an egg cracked into the middle of the pan or with cubes of feta cheese. 500 gr Cyprus potatoes (if you can’t find Cyprus potatoes, any good waxy potato such as Charlotte, Maris Peer will do). Peel and cut into quarters lengthways. 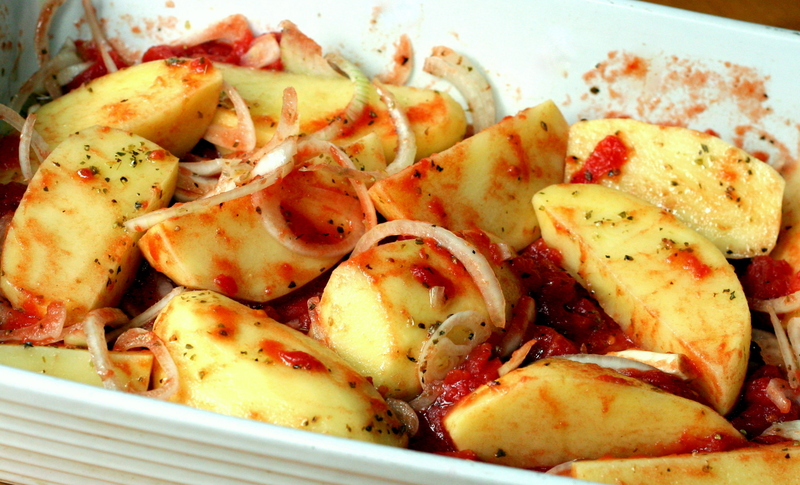 In a large baking tray or casserole, place the potatoes, onions and garlic. Add the chopped tomatoes, olive oil and lemon juice. Season with sea salt and grind over some black pepper. Mix everything together then gently pour over half a cup of water. Place the dish in the oven and cook, uncovered for 40 minutes. 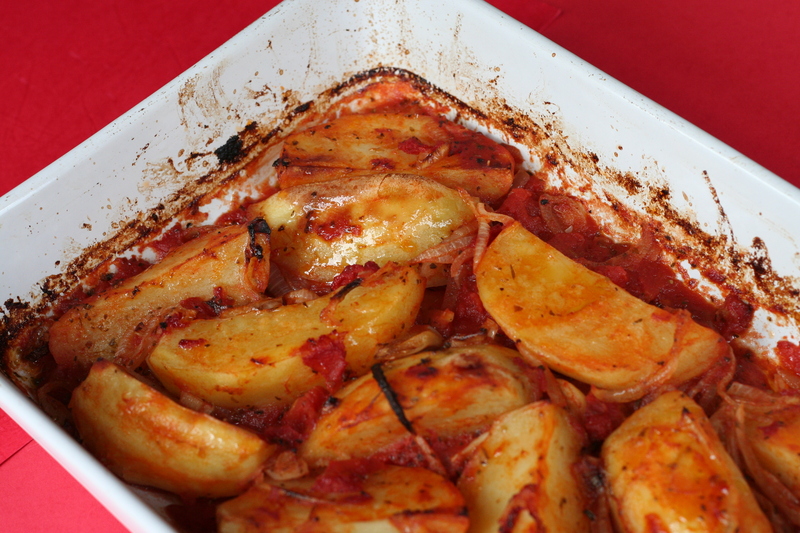 Take the dish out of the oven, baste the potatoes with the liquid and add a little water if it looks too dry. Replace and cook for a further 20 minutes. Remove from the oven again and test the potatoes with the point of a knife. They should be soft and golden and have absorbed most of the sauce. If not, return them to the oven for another 10 minutes. 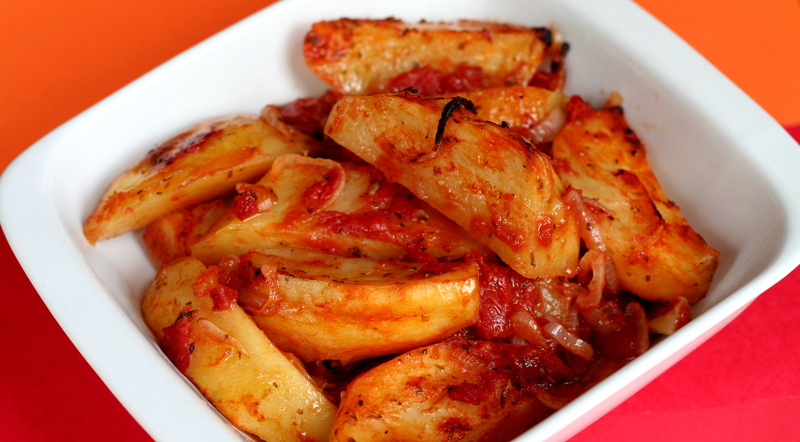 Remove from the oven and serve hot with a little dried oregano sprinkled over them. If you have another method for ‘roasting’ potatoes, please let me know in the comment box below.